Extend a VGA monitor and a PS/2 keyboard and mouse up to 100 feet. No Ghosting & No Degradation. Gold plated contacts. 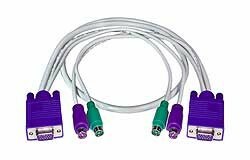 3-in-1 KVM cable extends a VGA monitor and a PS/2 keyboard and mouse up to 100 feet (30 meters) with a single cable run. Male 15HD, male 6 pin miniDIN to female 15HD, female 6 pin miniDIN extension. Male 15HD, male 6 pin miniDIN to male 15HD, male 6 pin miniDIN extension. “Thank you for your prompt shipment of my VEXT-25 cable. It arrived yesterday and works like a charm.